In most of the grocery shops you find these sweet shelves with all different shapes of toys with sweets in. I love these shelves. You can sometimes find some really fun little goodies there for your dolls. Recently I found these fun guitaars! The Purple and yellow ones actually have small sweets in them. The little blue guitaar is actually a baby rattle bought from the baby section of th etoy shop. 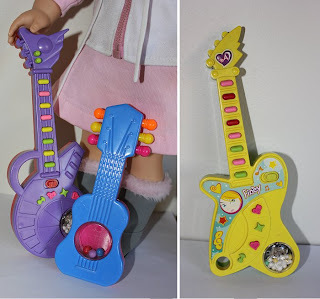 Now it is a guitaar for my doll collection!